Summary and Definition: The Aleut tribe were nomadic fishermen and hunters of the Arctic cultural group. The Aleut tribe live in the Aleutian Islands and the western portion of the Alaska Peninsula of northwestern North America. The Aleut people used kayaks for transportation and fishing and lived in semi-subterranean, sod-covered, structures called barabaras. Their name is derived from the Aleut word 'allithuh' meaning "coastal people" but they were called Aleut by Russian fur traders. 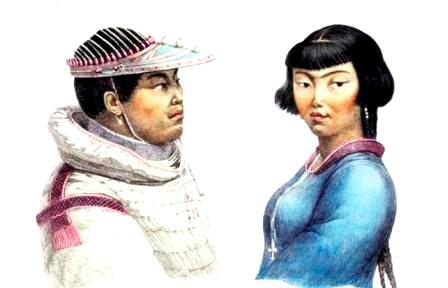 At one time they were referred to as "Eskimo" which was a general used to described the Aleut, Yupik and Inuit people. The people call themselves "Unangan". The Aleutian Islands, with their 57 volcanoes, consist of a chain of 14 large and 55 small islands. The Aleutian Islands of Alaska comprise of five groups: the Fox Islands, the Islands of Four Mountains, Andreanof Islands, Rat Islands and the Near Islands. The chief source of food for the Aleut people were whales, sea lions, seals and walruses. Different types of fish, and shellfish were also part of their diet, as were wildfowl and Arctic birds. 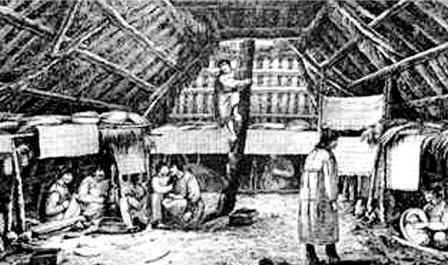 The Aleut lived in sod-covered houses called barabaras. What language did the Aleut tribe speak? The Aleut language belongs to the Eskimo-Aleut language family and includes three dialects: Eastern Aleut, Shumagin spoken on the Fox and Pribilof Islands and the Atkan dialect , spoken on Atka and Bering islands. Where did the Aleut tribe live? The Aleut are people of the Arctic Native American cultural group. The geography of the region in which they lived dictated the lifestyle and culture of the Aleut tribe. Climate and Land: The climate of the Aleutian islands is oceanic, with moderate and fairly uniform temperatures with frequent fogs, high winds and heavy rainfall with a volcanic landscape. What did the Aleut tribe live in? What clothes did the Aleut wear? The clothes, mitts and boots worn by the Aleut tribe were made from animal skins and furs from sea lion or sea otter skins. Bird feathers and puffin skins were also used when making clothing. Both men and women wore long tunics often accompanied by loose pants. In the winter the Aleut wore fur-lined, hooded coats called "parkas". For fishing trips in their kayaks the men would wear a light, waterproof coat, generally made from sea otter intestine, called a Kamleika. In the winter they wore soft Mukluk boots made from sealskin. In the summer it was not unusual for the Aleut to go barefoot. What forms of transport did the Aleut tribe use? The Aleut tribe used a small, narrow boat called a baidarka or a kayak for transportation and fishing trips. The kayak was lightweight, highly manoeuvrable and made using a wooden (driftwood) or whalebone frame covered with sealskin or sea lion skin sewn with sinew. The Aleut developed skills of righting a capsized kayak with, or without, the use of a paddle (called a kayak roll). What food did the Aleut eat? The staple diet of the Aleut were fish products and shellfish. These were supplemented by the meat obtained from sea animals such as the seal, whale and sea lions. The Aleut ate a great variety of shellfish including crab, shrimp, mussels and clams. Food was also obtained from birds such as ducks, cormorants, emperor geese, albatross and puffins. The abundance of birds also provided food in the form of bird eggs. Types of fish included Pacific cod, halibut, salmon and trout. The protein foods were supplemented with berries, roots, and edible plants such as kelp and wild celery. The following Aleut history timeline details facts, dates and famous landmarks and battles fought by the Aleut Nation. The history timeline explains what happened to the people of their tribe.